David Kachajian was washing dishes at home in Richmond last month when something caused his border collie to wake up from a nap and growl. Kachajian heard a scratching noise at the front door. Maybe it's the UPS guy, thought Kachajian, a Swanton police officer who is not easily rattled. He walked to the front hall and gazed in shock at an unwelcome visitor on the other side of the glass door: a large black bear standing on its hind legs, doing a full-body press as if to burst through and enter. "I couldn't believe what I was seeing," said Kachajian, who estimates the bear weighed around 400 pounds. "He just looked in, straight at me." Kachajian pulled out his off-duty .40mm handgun but didn't fire. He wasn't sure the weapon would have packed enough power to dispatch the bear. Plus, he didn't want to kill the animal, so he shouted and banged on the doorframe to scare it away. The broad-daylight encounter on July 28 was one of an increasing number of problem-bear incidents across Vermont this summer. Officials are warning residents and visitors, from suburban homes to backcountry campsites, to be bear aware. The Green Mountain State is home to one species of bruin: Ursus americanus, the American black bear, is smaller and less aggressive than its cousin, the brown bear, aka the grizzly. Nonetheless, adult males can weigh more than 500 pounds. Fatal maulings are rare, but as the number of black bears grows nationally, more confrontations have been reported — including some deadly ones. In two separate attacks in Alaska this June, black bears killed a 16-year-old trail runner and a mining contractor. Closer to home: In 2014, a Rutgers University student was killed by a black bear in New Jersey's Apshawa Preserve while hiking with friends. Black bears have fatally attacked three dogs in Vermont so far this summer. In separate incidents three weeks apart, bears killed two dogs in Wilmington. One was on a retractable leash in a yard; the other confronted a bear that had ambled onto its front porch. The third mauling happened in Pownal on July 4. A bear startled a family walking their Chihuahua off leash in the woods near their house. "The barking dog ran up to the bear," which "swatted" and bit the canine, according to Forrest Hammond, a bear biologist with the Vermont Fish & Wildlife Department. Hammond called all three incidents "cases of self defense" on the part of the bears. "There's a lot of history between bears and dogs that probably goes back to prehistoric times, where wolves and dogs and coyotes were mortal enemies of bears," said Hammond. Game wardens and wildlife officials recommend dog owners leash their pets. Like moose, bears were largely wiped out in Vermont in the 1800s by wary rural townspeople who hunted them down and also cleared their forest habitat. Beginning in the 1960s, the bear population began to rebound as some of that land became reforested. About five years ago, the bear population hit an estimated 7,500 — too many to roam without coming in conflict with people, according to state Fish & Wildlife biologists. So the department lengthened the bear-hunting season, which helped reduce the population to an estimated 6,000 today. Still, Hammond said, this summer has generated what seems like a record number of bear complaints. In Cambridge, one of the massive mammals burst through a screen window and ransacked an elderly couple's kitchen — and then tried to repeat the snack-attack on four subsequent nights. Game wardens hauled in a culvert trap, caught the animal and shot it dead. The U.S. Forest Service, meanwhile, has posted flyers at trailheads and tent sites in the Green Mountain National Forest warning visitors to properly secure food from bears in search of s'mores and hotdogs. "They are returning for a second and possibly a third helping in some cases," said Ethan Ready, a Forest Service public affairs officer based in Vermont. Responding to similar complaints, the Green Mountain Club this summer helped to install two new "bear boxes" — secure metal bins with latches that are chained to trees at shelters on the Long Trail. Like the Forest Service, the GMC is reminding people to hang food in trees and out of reach if it can't be secured in a car or such a bin. Three similar bear boxes were carted up Camel's Hump in 2015 after a hungry bruin repeatedly rummaged through campsites, searching for food, and rangers had to shut down the sites temporarily. Most of Vermont's recreation areas don't have bins because they haven't been necessary. Until now. Last year, Fish & Wildlife logged a record 866 reports of human-bear conflicts — up from 191 in 2006. They include bears that go into yards and campgrounds for food, eat livestock, and knock down bird feeders. "The incidents are definitely on the rise. They've increased every year for the last decade," said Tom Rogers, a Fish & Wildlife information specialist. "It's been a very steady upward trajectory." More bears, too, are dying in what Fish & Wildlife calls "incidental" kills. The 2016 tally includes 159 bears killed by motor vehicles; 33 killed by wardens or citizens who were protecting animals or property; seven bears killed illegally; and four deaths classified as "unknown" or "other." The total number — 203 — was almost four times the 56 reported 10 years ago. Bears that push their way into houses and tents don't tend to change their behavior, so it doesn't make sense to tranquilize and move them, wildlife officials say. If the threat is deemed significant, game wardens typically opt to euthanize the bear or authorize a property owner to shoot it. At least 10 Vermont bears have been put down that way so far this year, nine by property owners and one — the hungry bear in Cambridge — by a game warden. Attacks on humans in Vermont are extremely rare. The most recent fatal black bear attack happened in 1943, when a hunter in Townsend was apparently mauled to death. A woman on her deck in Cabot survived a bite to the leg in 2011. She'd been feeding bears, even though officials warned her against it, Hammond said. "That's the only injury to people that we know of that we've had in recent times," he said. Sightings, though, have sparked intense interest in the state. Earlier this month, a Fish & Wildlife talk about bears drew 70 people in Waterbury. Asked if they had experienced recent bear problems, about a third of the people raised their hands, according to Rogers, who gave the talk. "That's pretty high for an animal that's generally pretty secretive and tries to stay away from people," said Rogers, who focused on bears for his master's degree in wildlife biology. He dispensed the usual advice on keeping bears away: Secure garbage in sheds or latched containers; don't put meat or cheese in compost piles; and don't put out a bird feeder between April and November. "We like to call birdfeed the gateway drug," Rogers said. "That's what teaches the bear that your backyard is a really great place for food." What's going on with the bear behavior? No one's quite sure, but the animals seem more comfortable around people than they did before. Burlington had a bear sighting at a University of Vermont dumpster in 2014. "They've just begun to adapt to live closer to people than they had in the past," Hammond said. In some areas, they have no choice. Development in Vermont is pushing into lots that are close to forest, encroaching on bear habitat. The people who live there may not be equipped to shoot problem bears. "I think back when my grandfather had his farm, he would not have called somebody if he was having a problem with a wild animal," Hammond said. "I think he would have taken care of it, and the animal would have ended up in the cooking pot." The deep scratches on their deck and shingles remind David Kachajian and his wife, Jennifer, of what he called "too close of an encounter" in Richmond. The couple has taken steps to avoid luring bears to their home, which is on steep, wooded terrain near Bolton Valley ski area. 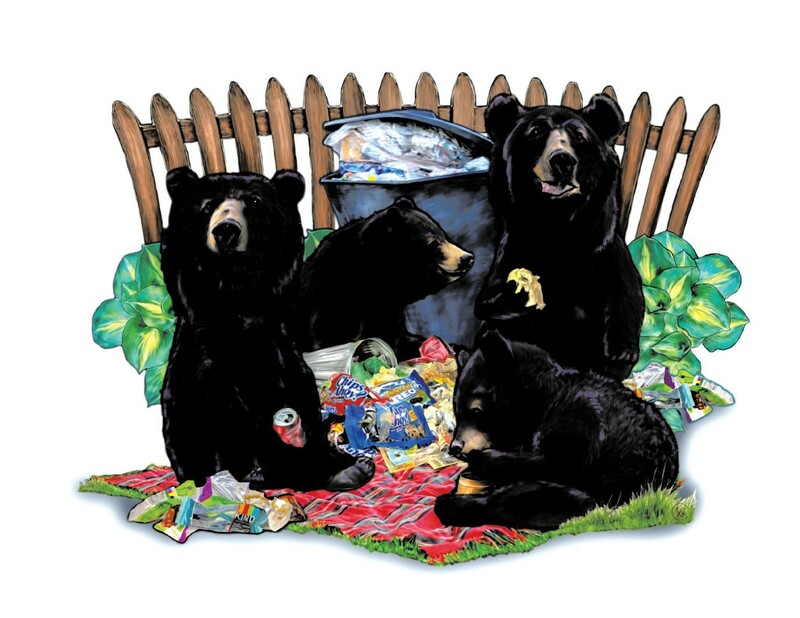 Earlier this summer — before the bear reared up at their front door — a bear or bears repeatedly tipped over their trash and feasted on the spoils. They've since secured the bins with cord and placed rocks on the lids. They don't have a bird feeder and don't compost. They don't even leave their ground floor windows open anymore. After the bear's visit to their deck, the couple called the local game warden, who told them they would be within their rights to shoot the bear should it come banging on the door again. "Would I want to shoot it? No," said David. "But if it did become a pest, I suppose we would have to do what we have to do."